Networking was the first way of marketing in the world. You market one to one instead of digitally one to many. Wear something memorable to stand out. Some wear a flashy name tag while others might wear a bowtie. Memorize your elevator speech. You never want to be reading it. Be a GREAT listener. We have 2 ears and one mouth for a reason. Never monopolize the conversation. It is not a race to see how many business cards you can give out. Give when asked for. Don’t allow one person to monopolize your attention the entire time. Become part of a board to have the opportunity to meet influencers. After you have a business card how will your follow up? Remember it is quality VS quantity. Build a solid relationships and you will build an outstanding referral network. 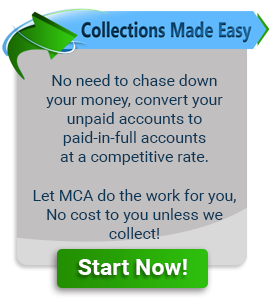 MCA is a third party debt collection agency that has been in constant business since 1950. We are rated A+ with the Better Business Bureau and we pride ourselves on excellent customer service along with delivering great recovery rates. There is no cost to you unless we collect! Why not try and re-coop some of your past due accounts with no out of pocket expense?